This post was originally published in May 2016. This Friday, 20th May, is the official last day of semester, so well done for making it this far! Though many of you will have no intention of coming near the Library for the next few months (it’s ok, we’re not offended, much) there is still a large number of students who want to or need to continue with their studies over the summer. 1) The Main Library and other site libraries* remain open during the summer vacation period. Opening hours and Helpdesk staffed hours may be reduced in some libraries so keep an eye on the opening hours web site and follow the Library on social media for updates e.g. @EdUniLibraries, @EdUniMainLib, Facebook, etc. Work is being done in the Main Library over the summer to increase the amount of study space available. Some of this work may cause disruption for limited periods of time. Follow the Library Development blog to keep up to date with the work being done. Books can still be requested from you at any time by other library users. 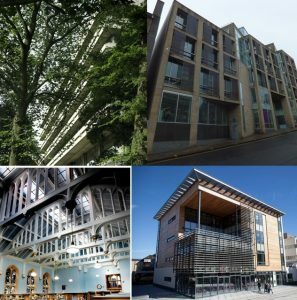 If you’re borrowing books from the Library over the summer and will not be in Edinburgh you must ensure you can return books on time if they are requested from you. Fines still apply – you will still be liable for fines if you do not renew or return your books on time. Renew your books and keep an eye on your library account via DiscoverEd. 3) You may not be in Edinburgh but you can still access the Library’s online resources. The Library gives you access to over 410,000 e-books, over 60,000 e-journals and over 240 databases. These can be accessed as normal via DiscoverEd or the Library web pages, normally just with your EASE username and password. Some of these online resources may require you to use the Virtual Private Network (VPN) to get access to them off-campus. Follow the instructions on the VPN website to set this up, for any queries on the VPN please contact IS.Helpline@ed.ac.uk. 4) Away from Edinburgh for the summer but still need to do some study or research? The SCONUL Access scheme gives students and staff from member universities the opportunity to get access to other member university libraries. So if you are going to be based near another university in the UK and Ireland you may be able to access their library via the SCONUL Access scheme. For more information and how to register please see SCONUL Access for University of Edinburgh students and staff. For any queries on this please contact IS.Helpline@ed.ac.uk or speak to a member of staff at a library helpdesk. 5) Graduating from the University this summer? Graduates of the University of Edinburgh can join the Library as an alumni. You can either join as a reference only user (membership lasts for 3 years) or as an external borrower (membership lasts for 1 year). For more information on how to register, the documents/ID you must provide to do so and what your membership gives you access to see Joining the Library: Graduates of University of Edinburgh. Graduates of the University can also get access to JSTOR. Access is provided via the MyEd Alumni portal. See Alumni benefits: JSTOR online journals for more information on how to get access. No matter what you’re doing enjoy your summer! This entry was posted in Library and tagged alumni, books, borrowing, e-journals, ebooks, graduates, opening hours, SCONUL, summer by cstirling. Bookmark the permalink.